Women’s basketball was a heavy underdog in Saturday’s opening round NCAA tournament game against Ohio State. Entering the game, the No. 3 seed Buckeyes had eight more wins on the season than the No. 14 seed Colonials, and ESPN gave GW just a 15.1 percent chance of pulling off an upset. Yet, after more than seven minutes of action, neither side had a clear advantage. At the time, Ohio State had the shooting edge, while the Colonials had success forcing turnovers and grabbing offensive boards. But as the game progressed, the more physical and experienced Buckeyes squad made clear who the better team was on the afternoon. They closed the first frame with a three-pointer from the wing and continued that energy to garner 22 second-quarter points. In the 10 minutes following halftime, Ohio State sealed the afternoon’s fate – outscoring GW 25-7 and holding the Colonials to a 16.7 percent clip. The Buckeyes (28-6) did not slow down, increasing their lead to more than 40 points in the final quarter and putting GW’s (19-14) season to an end with a 87-45 win at the St. John Arena in Columbus, Ohio. The loss marked the third time in four years that the Colonials reached the NCAA tournament with an Atlantic 10 Championship title and lost in the first round. It also snapped GW’s four-game winning streak. GW’s trip to the tournament seemed unlikely earlier in the year when the team started non-conference play with a 3-7 record and lost its first A-10 matchup. The victory sends Ohio State to the second round, where the Buckeyes will host Central Michigan in another elimination game Monday. Against the Buckeyes, Cummings led GW with 14 points to go along with five rebounds. Along with fellow seniors forward Kelli Prange and guard Camila Tapias, Cummings finished her GW career with 94 wins. “I don’t know that there is a better three kids that proved what GW is all about and what we’re made of,” Rizzotti said. Prange added eight points off the bench on 25 percent shooting, and freshman forward Neila Luma anchored GW’s inside play with 12 points and seven rebounds – but none of the other Colonials made more than one basket in the game. As a team, the Colonials shot just 27.3 percent on the contest and faced difficulty finding the net late in the game after seeing some early success from behind the arc. GW was never able to put together a sizable run in the final two quarters and never led on the afternoon. On the other end of the floor, GW allowed Ohio State to connect for 55.9 percent shooting and 48 second-half points – but the Buckeyes’ top scorer tallied more than 13 points under her average. Ohio State senior guard Kelsey Mitchell entered the night as the third-highest scorer in the country with 24.5 points per game – but scored just 11 points on 4-of-11 shooting. Still, she collected a game-high seven assists and helped facilitate redshirt senior forward Stephanie Mavunga to her game-high 22 points on a 9-for-12 clip. Behind Mavunga and senior forward Alexa Hart, the Buckeyes commanded the interior for the last 30 minutes of action and finished with a 25-rebound advantage and 26 more points in the paint than the Colonials. The attacking style from Ohio State led to 21 trips to the free throw line, where the team made 16 shots and forced GW to hold back its aggressive defense at times. 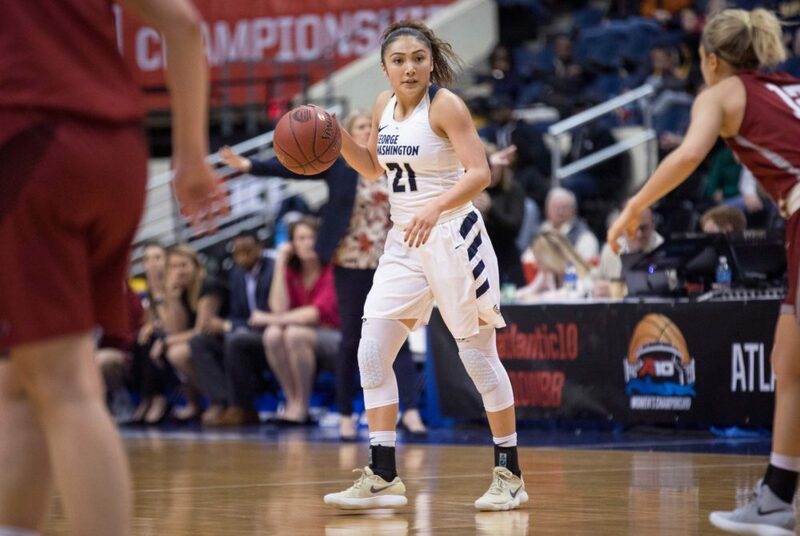 In the first quarter of play, GW struggled to score to start, but a four-minute Buckeyes scoring drought and distance shots from Tapias and junior guard Mei-Lyn Bautista kept the Colonials in the game. Both sides increased their scoring output before halftime and at times, the two sides went layup for layup. The Buckeyes’ scoring increase in the second quarter was larger, and jump shots in the final few minutes before the break allowed them to take a 39-27 lead into halftime. In the third quarter, GW allowed a 11-0 Ohio State run in the opening minutes and the Colonials’ defense was often defeated by play in the paint. The Buckeyes took a 30-point lead into the final frame and kept pushing. Rizzotti subbed off her seniors with less than two minutes to play and allowed the underclassmen to finish off GW’s season.